Momma Told Me: Deck the halls with color and cheer. I love the holidays. But not for the obvious reasons- I love it for the color. When I was just a little girl I recall watching How The Grinch Stole Christmas, (1966) animated version, and fell in love with the vivid colors and the people of Whoville. I'd imagine myself in a fluffy white land where everyone's hair fell in wisps, rather than waves, and jolly citizens buzzed about capping business ledges with rainbow lights and decorating trees with mesmerizing gifts. Of course, in 200, when the tale was re-imagined in live action, the perfectly cast Jim Carrey brought to life the green little grouch with the tiny heart that still could. Faith Hill's screen-recorded Where Are You Christmas? quickly found a place in my own Seussical heart as one of the timeless anthems of the holiday season. I must've watched that film dozens of times, until the lines and cast were playing in my sleep. Now, whenever the song comes on the radio, throughout December, I take a moment to pause and recall the true meaning, and magic, of this holiday season. And what better way to explore the Seuss-like explosion of color and rhymes than with Willy Wonka inspired confections by Nestle? In honestly, if I lived alone and modesty was not a thought I'd own a hot pink pre-lit tree 10 ft tall, with purple garland and an array of neon glass ornaments. My holidays would be filled with sun-glass wearing flamingos, hula dancing sharks, and that one Hallmark Jukebox ornament that carefully curates holiday tunes. There's be lime green globes and teal icicles, and a never-ending ribbon of silver garland; my stairway taunting seasonal guests with a delicious display of rainbow candy canes. Sure, there's something to be said for classical holiday icons and simple traditions; but I also enjoy the festive trends which live long past December 25th. So, this year, I picked up a box of Wonka SweeTARTS Candy Canes, featuring three fruity flavors, I often hear are some of the 'best' candy canes received. Not only do these colorful canes help celebrate the holidays with a little extra magic and pizzaz, but the Chery, Green Apple, and Blue Raspberry flavors appeal to a wide range of palettes, and those who often shy away from traditional peppermint canes. With a beautiful multi-color swirl pattern, each of the Wonka canes are filled with plenty of genuine SweeTARTS flavor; I can never choose a favorite! 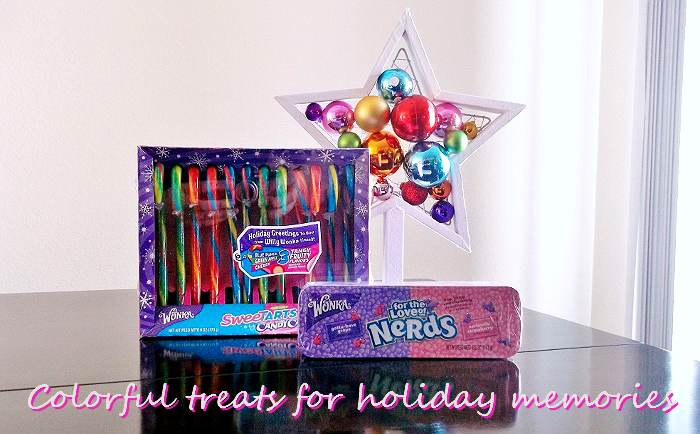 Nestle has plenty more specialty holiday treats to stuff stockings with and decorate gifts this year, including Wonka Pixy Stix Giant Candy Canes, housed inside a giant plastic cane with Wonka flavored Pixy Stix. There's also the Nestle Stocking Stuffer Tins which feature miniatures from brands like Butterfinger, Baby Ruth, 100 Grand, and more. It's not hard to locate these popluar holiday confections, spot them in the holiday confection aisles of your local grocery store, Walmart, Target, and similar retailers nationwide! While I may be wildly colorful and 'holiday funky' I also like practical products that I can transition out of the season as well. 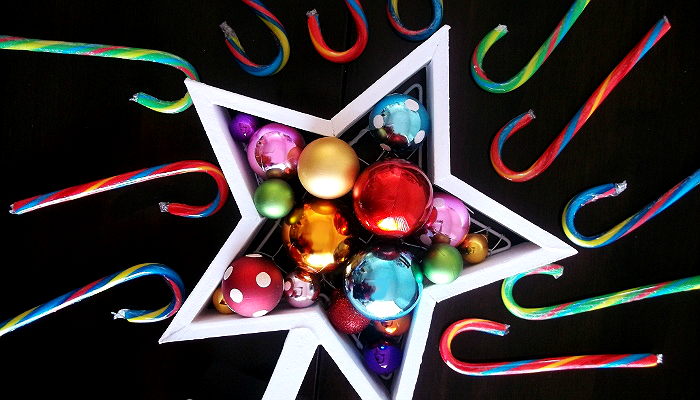 Who doesn't have a handful of candy canes laying around when the new year comes? Wonka SweeTARTS candy canes make a great ingredient for a very simple, and wonderfully celebratory, confection I like to call Wonka Rainbow Avalanche Bars. These are sure to be a hit with the guests, young and old, at your upcoming New Years Eve party, or even an upcoming birthday bash. Chocolate Bark is one of my favorite go-toos for leftover holiday candy, as it's as easy as smashing your extra candy and melting your favorite baking chocolate. I'll admit, I had reservations about pairing the fruity Wonka canes with white chocolate but the result was addictive. Not only did the soft white chocolate make the crushed canes easy to consume, but the flavors complimented one another quite nice. 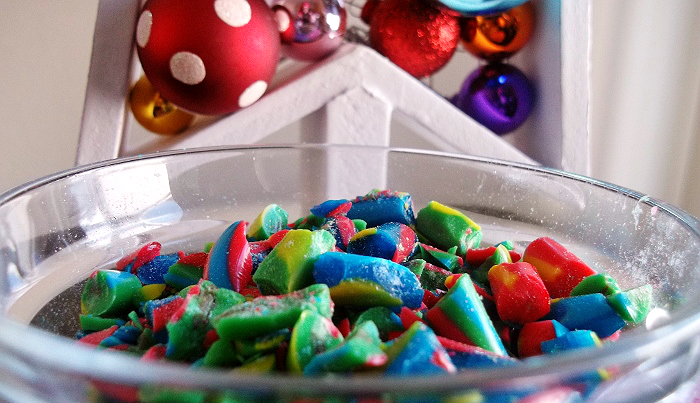 What do you do with leftover holiday candy? 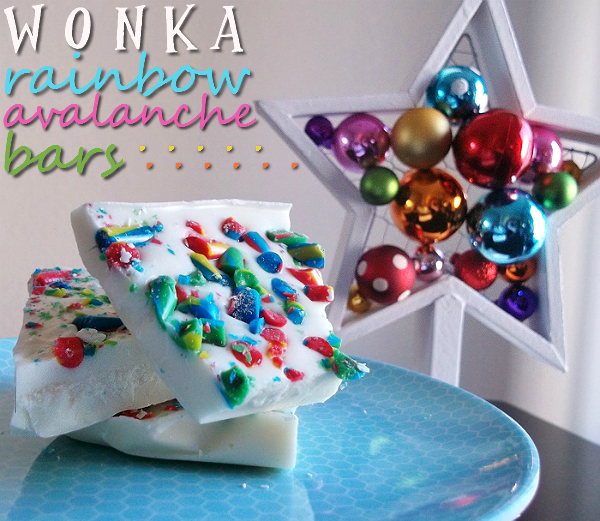 What Daughter Says: Nestle is a colorful favorite year-round, and so are these easy Wonka Rainbow Avalanche Bars. 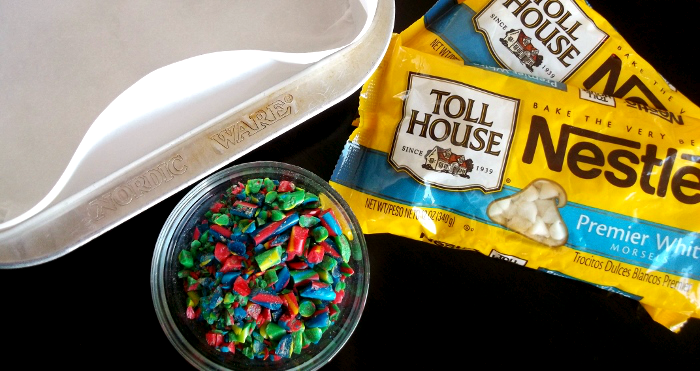 *** Click for printable rainbow bark recipe. 1.) Line a 9 x 9 baking pan with parchment paper. Cut slits inward along 'corners' to allow for even lining if desired. 2.) Melt white chocolate morsels in a double broiler until consistency is even and smooth. Carefully pour chocolate into lined baking pan, allowing the chocolate to settle evenly along the bottom. 3.) 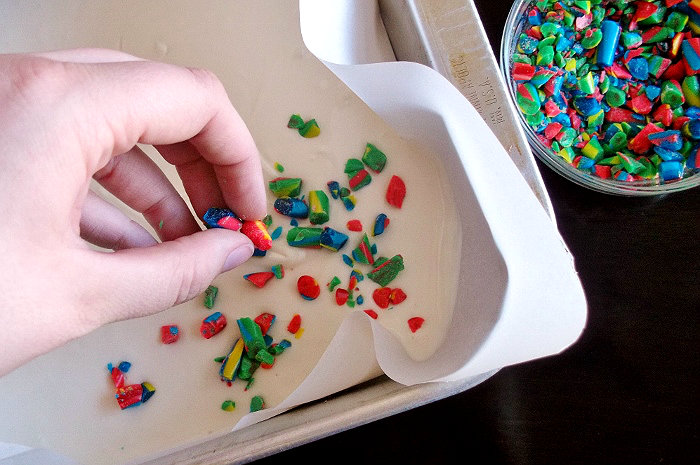 Sprinkle crushes Wonka canes atop chocolate, allowing to sink just into surface. Refrigerate 1-2 hours until chocolate has set. Freezing may be used to speed up process. 4.) Remove pan from refrigerator and pull bark wedge out of pan by lifting parchment paper. Flip the bark onto the parchment so that the candy cane side is facing down. Gently break apart into uneven chunks, with your hand. Enjoy! I actually prefer these Wonka Canes to regular ones. I love tart candies and your bark looks divine! The bark looks delicious and the pictures are beautiful! So colorful!!! This is so cute!!! They look delicious!! What an idea! I am doing that gelatin style! They really do remind me of Charlie and the Chocolate factory! 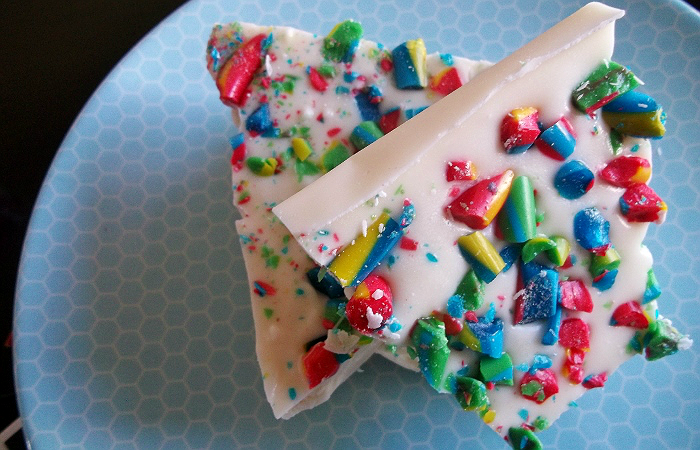 I never thought of making a candy cane bark with the colorful ones. I think my kids would LOVE this! I think you may be Willimina Wonka yourself. .LOL! Wow those are colorful. I don't think I've seen those before. These look cool! Happy Holidays.